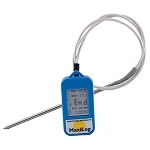 The Ultra-Low MicroDL w/ Flat Flex Probe is a temperature data logger designed for monitoring extremely cold environments reaching temperatures as low as -80°C. 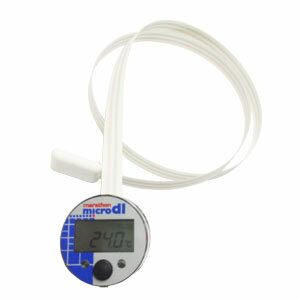 The primary enclosure with LCD display is affixed outside the ultra-low environment, while the RTD probe located on the opposite end of the flat flexible cable is deployed in the Ultra-Low environment. 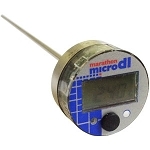 The flat flex cable is 20" long and .3" wide and is able to pass around doors or container lids without disturbing the integrity of the seal. (If your application requires the entire unit to be contained in the ultra-low environment, please contact us.) 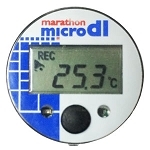 The Ultra-Low MicroDL loggers are available in 8KB, 32KB, or 64KB memory capacities. 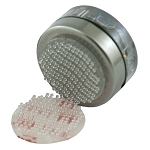 They are ideal for monitoring dry ice packages, such as those used in Red Blood Cell products, and ultra-low freezer applications. 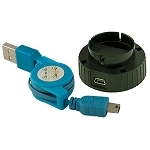 These multi-use loggers may be downloaded, reconfigured, and deployed numerous times, and can last for months to years in most applications due to the ample storage capacity and battery life.